When life gives you lemons, make lemonade. When it gives you grapefruit, you can squeeze some terrific grapefruit juice. Or, you can go glam with grapefruit sorbet, one of our passions. You don’t even need a sorbet maker. These two recipes are for grapefruit granita—a “crunchy” sorbet. All you need to do is sweeten fresh-squeezed grapefruit juice to taste, cook it with water until the sugar dissolves (or substitute simple syrup for the sugar), pour the mixture into a pan and put it in the freezer. Then, just break up the ice crystals as they form in the pan, every two hours or so. Here’s a more precise recipe for this easy grapefruit granita. We prefer this more sophisticated recipe for grapefruit granita with fresh tarragon, a perfect complement to the tart grapefruit. If you’re not a tarragon fan, substitute mint. While you can use any type of grapefruit, pink or red grapefruit (Marsh Ruby, Ruby, Rio Red and Star Ruby are examples) enhances the appearance. The most memorable granita we’ve ever had was at a Michelin two-star restaurant in the south of France. It was appropriately flavored with herbes de Provence—basil, lavender, marjoram (a member of the mint family with citrus and pine notes), rosemary, sage and thyme. No grapefruit juice was used. The recipe was simply water, sweetened and frozen with these heavenly herbs. Try it. 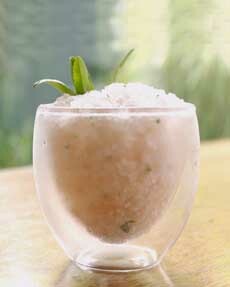 You can serve grapefruit granita as a palate cleanser; or enjoy it as a light dessert or an after-dinner drink. Pop a scoop into a glass of gin, tequila or vodka. Or do the reverse: Add three tablespoons of gin, tequila or vodka to the granita mixture before freezing. Find more of our favorite sorbet and granita recipes. Master the differences between granita, sorbet, ice and other frozen desserts in our Ice Cream Glossary.